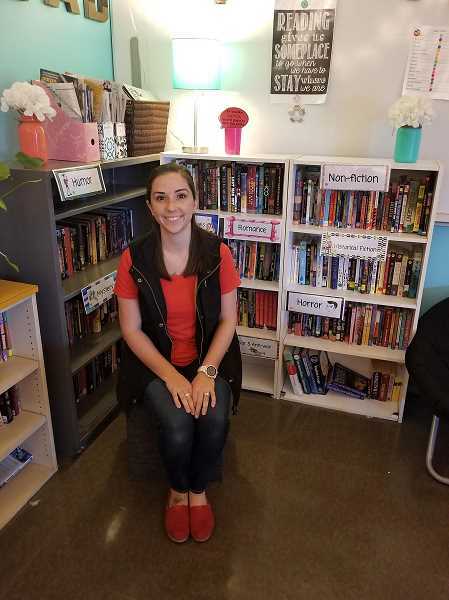 While candidates all over Oregon are asking for your votes in the Nov. 6 election, one North Marion Middle School teacher is asking for your votes simply so she can promote literacy in her little corner of the world. Elyse Hansen is an eighth-grade English language arts and humanities teacher at North Marion Middle School. She has been nominated for a $2,500 classroom grant from Farmers Insurance's Thank America's Teachers program. Through the program, Farmers will award 180 teachers with the $2,500 grants and five with $100,000 educational grants, totaling nearly $1 million in grants. In her five years at Farmers, this is the first time local agent Christina Gutierrez has met a teacher who has taken advantage of the grant program. "The cool thing about it is it is a nationwide grant (opportunity)," Gutierrez said. "So, I think it's neat out of everyone in the United States, Elyse went ahead and went for it." But Hansen can only win the grant if she obtains enough votes. If Hansen is awarded the grant, she wants to promote literacy at the school by building her classroom library and holding a literacy event. "I'm wanting to use the money to purchase more books for my classroom," Hansen said. "I really want to create a love of reading with my kids, and one of the best ways to do that is to get more books. Books are expensive. A hardbound book is usually $15-20 a piece. I want to get books that I know kids are going to be interested in, that are culturally relevant and newer. So, that means buying them. "By creating that love of reading, kids will be readers for life," she continued. "And so, the more votes I can get, the better chance I have of winning to purchase those books for my classroom." It's not just Hansen asking for votes, though. In addition to students voting daily, when Gutierrez visited the school to advocate for Hansen, she encountered students encouraging their parents to vote too. "I was over at her parent-teacher conferences. I set up a table for her and was talking to people," Gutierrez said. "And it was the students who came by, saying, 'Oh mom, this is my teacher. You have to vote. She's great.'" North Marion Middle School's Principal of Teaching and Learning Tami Badinger expanded on the definition of "great" when it comes to Hansen. "Ms. Hansen has a way to make learning relevant, engaging and rigorous," Badinger said. "If you visit her classroom you will see reading nooks, mood lighting and student work hung to showcase how proud she is of their accomplishments. The environment she has created produces a climate of trust, vulnerability, cooperation and kindness. She makes a point of connecting with each and every student to ensure their success and feeling of well-being." Not only would the grant impact Hansen's students, but it could benefit the entire school. She hopes to use leftover grant dollars to hold a schoolwide family literacy night, where families could participate in literacy-themed activities. "My goal would be that every kid, 0-18, leaves with a free book," Hansen said. Vote for Hansen here. Each person can vote once per day until voting closes Nov. 3.